The perfect balance of micromist technology and mobility for everyday activities. The ultra-slim, lightweight, and highly versatile Misty 2.5 personal mister is optimally designed for mobility. Save $4.00 on this 2-pack of Misty 2.5's! Includes two Steel Blue Misty 2.5's. 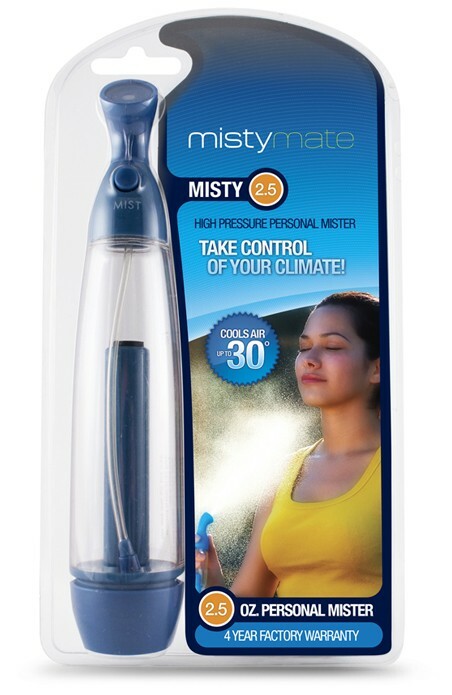 The battery-free Misty 2.5 pressurizes easily by hand and with a push of a button it propels an ultra fine mist that creates an instant cooling sensation that has to be felt to be believed. With a fluid capacity of 2.5 oz, this reusable mister is constructed of heat-resistant polycarbonate and other high-grade components to deliver a continuous stream of ultra-fine mist on command. • Push button allows for a continuous stream of ultra fine mist on command. • Currently available in Steel Blue. Every time I am at an outside activity and have a Misty Mate with me the kids come running to be cooled off. Often times other mothers ask where to purchase one and I gladly give them your website. Thx!